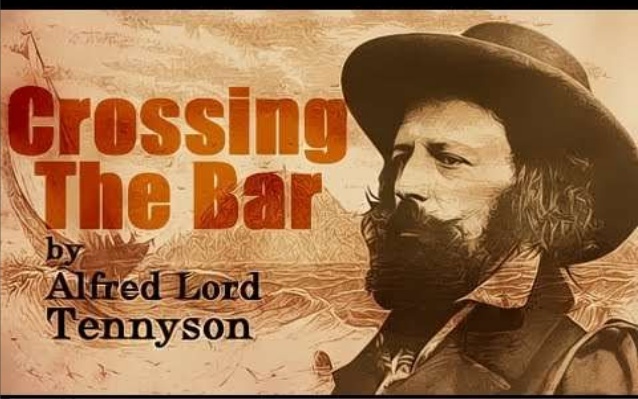 Non-African Poetry: Crossing the Bar by Alfred Tennyson Summary, Setting, Author's Background, Themes, Language and Style for JAMB, WAEC and NECO Literature Students 2016 - 2020 Syllabus. "Crossing the Bar" is an 1889 poem by Alfred, Lord Tennyson. It is considered that Tennyson wrote it in elegy; the poem has a tone of finality and the narrator uses an extended metaphor to compare death with crossing the "sandbar" between river of life, with its outgoing "flood", and the ocean that lies beyond [death], the "boundless deep", to which we return. Alfred, Lord Tennyson was the Poet Laureate of Britain and Ireland "for some decades and "Crossing the Bar" is one of the poems he treasured most. Accordingly, it speaks of the wish of the poet to have his readers see the poem as his last creative effort and, by implication, a symbol of his final action- a meditation and preparedness to embrace death whenever it comes - before his transition to eternity. An account has it that Tennyson, while on a short voyage across the solent, a body of water that separated mainland England from the Isle of Wight, got very sick He later recovered, but had got jolted by the possibility of death. "Crossing the Bar" was written when Tennyson was eighty years old, three years before his death. John Donne's metaphysical poem, "Death Be Not Proud" is one of the poems that demystify the power of death; Alfred Tennyson's "Crossing the Bar" is another. In another of Tennyson's poems titled "All Things will Die", the poetic persona states thus: "The streams will cease to flow/The wind will cease to blow/ The clouds will cease to fleet/The heart will cease to beat/For all things must die/All things must die". Indeed, all things must live and die. Death is a phenomenon that is common to both the rich and the poor, and to the wise and the simple and Tennyson emphasized this point in "Crossing the Bar". The poem is a meditation on death. It begins with a reflection on the poetic-persona on what he describes as "one clear call for me!" (I z) on a certain evening when he realizes that it is time for him to go to the sea. Therefore, "Crossing the Bar" relates the poetic persona's preoccupation with the coming of death, an inevitable phenomenon. Instead of the usual fright and anxiety that may display at the approach of death, the poetic persona faces death calmly. At the literal level, the "bar" in this context is a nautical term for a ridge of sand formed at the shore, by moving tides. At the metaphorical level, the "bar" refers to crossing the threshold from mortality into another realm of experience possibly immorality. Lines 1 - 4 This stanza begins by drawing attention to the temporal setting and the poetic persona's moment of awareness. He becomes aware of the inevitable journey ahead of him following "one clear call" (1 - 2). The call comes on a certain evening while the persona beholds a star in the gathering darkness in the sky. The "Sunset and evening star" act as a reminder for the speaker that it is time for the journey, he wishes for a clement weather or peaceful passage. Thus, this first stanza introduces the setting of the poem. It relates the fact that the end of a period is at hand. The word "sunset" and "evening star" denote a drawing to a close, the poetic persona realizes that his life is gradually drawing to a close, as he nears the end of his days on earth. Lines 3 - 4 present the wishes of the persona. He wishes that there would be no morning of the bar, when he goes on a sea voyage, as he proceeds to answer the call. Lines 5 - 8 This stanza continues and re-emphasizes the poetic persona's wish for a clement weather in the course of his impending voyage. He looks forward to a tide that moves as if it is asleep. Usually, turbulence in the movement of the sea occurs when sea creatures are hyperactive or other elements like the wind force them out of their position in water. Realizing this, the persona wishes for a tide which comes after such creatures and returned to the "boundless deep"(1 . 3). The first stanza already relates that the persona is ready to set forth, in order to heed the call. The second stanza presents the persona's wish for a favorable condition for the voyage. Seafarers usually long for a full tide that would make the climbing of the sandbar easy and uneventful. When such a full tide sweeps the ship across the sandbar, there would be "no moaning of the bar" (1.3). Lines 9 - 12 These lines, beginning with "Twilight in the evening bell"(1.9), draw attention to the time of the poetic-persona's meditation After twilight, naturally darkness falls. Apparently, the darkness is equated with the persona's departure since darkness will render him invisible. He hopes that his departure will not cause any kind of sadness or wailing from his loved ones. This 9th line, "twilight and evening bell", reiterates the imagery of a closing, an ending. Here, the poetic persona contemplates what happens after a voyage to the land of the unknown. He relates that after the transition from life to death, there would be "the dark" (1.10), which symbolizes all that is unknown about the next life. Lines 11 - 12 state the persona;s wish for an uneventful death. He wishes that there would be no sadness and sorrow when he finally departs this life. The word "embark" (1.12) depicts that the persona is getting off from this present life and entering into another realm, another phase of experience. Lines 13 - 16 Here, it is noted that the poetic persona's journey is such that time and space cannot limit. However, it is still worthwhile because it will afford him the chance to "see my Pilot face to face" (1.15). In this stanza, death is figuratively captured as "the flood" (1.13) that translates a person from one phase of existence to another. The last line, line 14, "when I have crossed the bar", again relates the certainty of the poetic persona's approaching death. He faces his phase of life with courage, hope and equanimity.